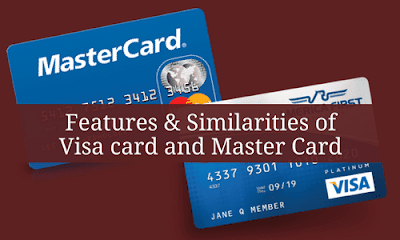 Both these cards provide the required technology and networks for processing card payment. These are the largest card processor network in the global. Both are the intermediaries between the bank and the client. Visa card is a payment network company which transfers the fund electronically all over the Globe. It is the first multinational financial service provider company in California, the USA in 1958. It also provides many financial services like a credit card, debit card and prepaid card to clients. It collaborates with the financial institutions like banks to cater the services under their company name. The interest charges, transaction fees are decided by the bank or financial institutions, not by the network company. The payment technology network charges some percentage to the issuing company. And this is the source of income for them. The master card company is located in New York, USA since 1966. This company is earlier known as Interbank or Master charge. It is a multinational payment technology network company which provides financial services to the customers. It is processing payment company. It also provides the services like a debit card, prepaid card, charge card, under their company name. The company doesn't directly interact with the customers, it collaborates with the banks and financial institutions to serve the benefits. By using both these cards, the customer can easily make a payment just by tapping the card to a compatible reader. This will ease the life of customers. They provide a variety of cards like a standard card, premium card, Platinum card, signature card and many other. It provides the various types of offers and services like global customer assistance, complimentary services, facilities at stores and at hotels, shopping offers, discounted services to special cardholders. Both this card protects the online transactions in a very safe and secure way. They charge from bank or financial institutions for using their payment technology network. Card issuer pat the fees while doing settlement. They charge fees for international settlement. They charge somewhat more for foreign currency transactions.